Monday, May 28, 82 k ride. I'm up at 6:10, shower (cold water again) and dress/pack for the bus ride + biking (basically, putting the bike shoes, gloves and helmet at the top of the panniers). Downstairs, I confirm the directions to the bus stop, and pay. I quickly figure out that I'm timing this a little too tight. I blast down the road between the post office and tourist office, go a few blocks, then cut behind the mosque. There, across the street, a big bus is just pulling away from a stall. A guy looks over. I call out "Hama?" He says yes, I ride over, and the bike is nearly torn out from under me as it's tossed into an underneath storage compartment. On the bus I'm assigned a seat in the back row, and after quick stops, the bus is entirely full. An attendant offers tea to everyone, but this time only two cups are available for the 50 of us. We are at Homs in perhaps two hours, and a third of the people pile out. 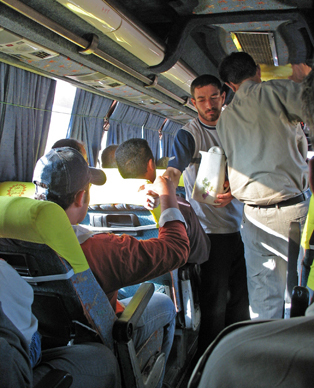 So Hama is apparently just a later stop on the Homs bus. Although I've paid for a Hama ticket, I quickly decide that it's stupid to ride a bus north in order to ride a bicycle south, and I hop off. I'm also thinking that this 9 am arrival makes Mar Musa do-able today. I'm off the bus, but getting the bike out from underneath is a bit harder. The luggage hand struggles to get my bicycle out as heavy traffic rips by the bus-refusing to slow down or give him any room. The bus driver, meanwhile, has not really stopped the bus, and the bus is creeping forward the whole time. Maybe he doesn't like the luggage guy. Once I have the bike, I switch to cleats and helmet and add sunscreen; it all takes time. Taxi drivers keep coming up and asking, "Ride? Ride?" I realize that I need more for breakfast than the two bananas I've had, so I enter the bus terminal, looking for an eatery. I have two shwarma; unfortunately, they're only OK. I'm finally rolling at 9:45 am. I get a nice photo of shepherds plus another fun photo of the bent-over trees. The sky is somewhat overcast, which is a blessing temperature-wise. There is plenty of water/soda stops for the first half-hour or so, but then there are none. The sun gets hotter. I push till noon, then cower under a small tree and eat a tube of sugar cookies plus some other crackers I'm carrying. It becomes a 45-minute break, as I pick off the newest batch of tar specks from some roadwork I passed through this morning. Finally, some buildings appear, and one has a small store. I load-up on water and soda, and ride on. Maybe a half-hour or so later, just outside of Qara, I happen upon a fancy restaurant with a very strange western/medieval theme, complete with wagon wheels, swords, and hookahs. I spend at least a half-hour here, meeting all the staff, and chatting, if you can call it that, using bits of English, German, and pantomime. I learn that there's a hotel in Nabk, the town by Mar Musa, and that they will help me get a good price, and that it's only 10 k from here. This is all great news; I can relax, and I do. I learn that two of the younger men are Kurds and are pro-Bush, and everyone else, of course, is anti-Bush. As I'm leaving, I'm told that the hotel is before the overpass, and I'm given a business card with a note scribbled on it in Arabic. Free chai is a nice touch. But you may want to bring your own cup.. I stopped because their herd was stopped. Right in the middle of the road. These trees, and thousand of others, were permanently tilted to the east. 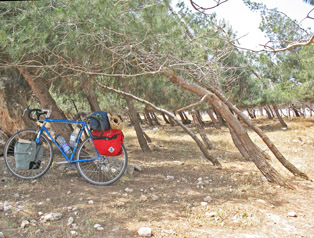 Further proof that riding west from Palmyra back to Homs or Damascus might have been nasty. 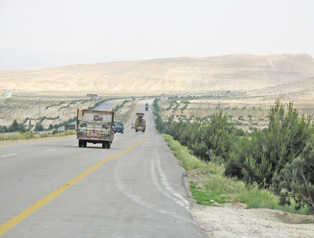 The road south of Homs was boring.